Plug type: UK plug. Due to the light and screen difference, the item's color may be slightly different from the pictures. Upgrade power support 96W. Output power: 96W. 8 interchangeable adapters for flexible adaptation to different notebook models. Power LED indicator. High efficiency and low energy consumption. Output current: 4-5A. 1 x Universal Adapter for Notebook. for HP (Pavilion, Omnibook). for IBM ( T series ThinkPads). for Lenovo. for Gateway. for Compaq (Armada, LTE, Evo, Presario, Prosignia, Tablet). Simply plug the 12v adapter into the cigarette lighter and plug the connector of your choice into your laptop for charging on the go! Fuse for overload protection (10 AMP). High efficiency and low energy consumption. Plug type: UK plug. Due to the light and screen difference, the item's color may be slightly different from the pictures. 1pcs 8 port connector. Our goal is to make sure that you can find exactly what you are looking for and make it easy for you to place your orders. Perfect for laptop/notebook computers. Indicator Light Yes. 8 x EU laptop adapter's connector. Continuous Output Power 120W. Peak Output Power 144W. Socket Output Current 5A. Output Current 1A. Output Frequency 50~60Hz. Output Socket EU. We are doing our best to provide you a pleasant online buying experience. Personal Cloud HDD Single-Bay SATA Hard Drive USB 3.0 3.5" NAS Network Storage. 360° Motion Sensor Security Led Light Battery Operated Indoor Outdoor Garden. 120 Pcs/Set Plastic Food Fruits Vegetables Toys Kitchen Pretend Role Play ToyUK. 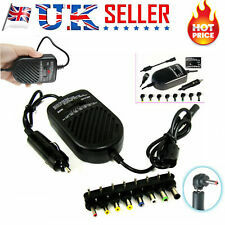 New listingKENSINGTON LAPTOP MULTI CHARGER . 1 X Free UK Fuse Power cord. 1 X AC Adapter. Input: AC 100-240V 50-60Hz, Worldwide. We have the best aftersales service. Your reliance and supporting are our great honors. Output power: up to 90 watts. (1 X Free UK Fuse Power cord. Output power: up to 40~45watts. Output DC connector:6pcs, detachable. 1 X AC Adapter. automatically close your account if you accumulate 4 UPI's total.). We have the best aftersales service. Replaceable Ceramic Ionic Flat Iron Salon 4 in1 Hair Straightener Curler Crimper. 13.9" HD TV Portable DVD Player 16:9 LCD 110-240V 270° Swivel Screen UK Plug. Desktop PC Ultra-Slim Thin Quiet Wireless Keyboard and Mouse Sets 2.4GHz Combo. 1 X AC Adapter. Input: AC 100-240V 50-60Hz, Worldwide. Output power: up to 90 watts. 1 X Free UK Fuse Power cord. There are no exceptions! Your reliance and supporting are our great honors. We have the best aftersales service. 33W to 90W 18.5V to 19.5V. Exclusively made for HP / Compaq laptop, netbook, notebook and tablet with the following specifications: 18.5V, 19V, 19,5V, 20V, 25W, 33W, 40W, 60W, 65W, 70W, 75W, 80W, 90W, 4.74A, 4.7A, 4.62A, 4.5A, 3.95A, 3.42A, 3.34A, 3.33A, 3.25A, 3.16A, 3A, 2.37A, 2.31A, 2.1A, 1.58A and 1.75A. Outout : 15/16/18.5/19/19.5/20V ( 90W Max). Find the correct connector by trying to plug it in the device. Size of original tip of adapter: 5.5x2.1mm(Acer). Condition: New. Portable and ultrathin design, just half thickness of general power adapter. Very convenient for taking around. 100% compatible with the original one. 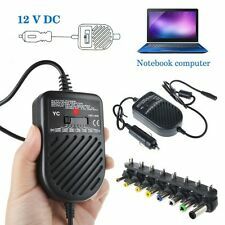 Powseed 65W Universal Laptop AC Adapter with 17 Connectors. Condition is New. 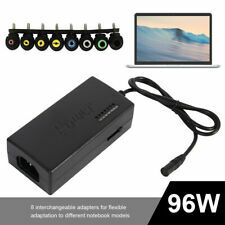 POWSEED 90W NEW Universal Laptop AC Adapter with 17 Connectors. Powseed products are certificated with CE, RoHS approval, 100% compatibility with the original. Max Power: 90W. We will give suggestions. Designed for UK use and UK plug socket. 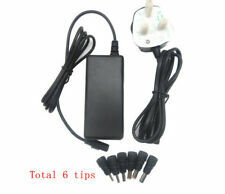 Product details: Laptop AC Adapter, H004-1, 19V, 4.74 A, TIP 7.4/5.0, 90W. Such as battery, ac adapter etc. (Apply for Battery Only). We will very appreciated for your doing. E-100M / E-100M-G / E-100M-SB / E-155C / E-155C-G / E-265M / E-265M-G / E-475M / E-475M-G. GATEWAY E Series. Adapter Output: 19V 3.42A. Type: Laptop AC Adapter. Laptop Screens. Laptop Adapters. Laptop Hard Drives. Adapter Input: 100-240V~1.5A 50-60Hz. Laptop adapters from various other adapter manufacturers can be used as long as the specifications are similar to the existing adapter. Due to the light and screen difference, the item's color may be slightly different from the pictures. Anyway we will try our best to avoid this kind of thing. Widely used on SONY/HP/IBM notebook charging. With LED indicator for convenient use. Input Power: 100W. Output Power: 96W. Note: The real color of the item may be slightly different from the pictures shown on website caused by many factors such as brightness of your monitor and light brightness. Add to Favorites. we need support from all of you. Our Policies. Endding Soon. Output Power: 96W. Widely used on SONY/HP/IBM notebook charging. With LED indicator for convenient use. Input Power: 100W. Note: The real color of the item may be slightly different from the pictures shown on website caused by many factors such as brightness of your monitor and light brightness. Output power enough;. 1× 96W power adapter. Output: 12V-15V-16V-18V-19V-20V-24V. Due to the difference between different monitors, the pictures may not reflect the actual color of the item. 1× 8 pieces power connecters. Maximum power: 120W. Standard: EU standard. Overheat protection, overload protection, short circuit protection. 8 x Laptop Adapter's Connector. Extra USB port for charging a second device. Power connectors: 8 power plugs. DC Output Amp: 1a - 5a (Auto)ÂPower Output: 90W Max (Auto) Â. Its been tested vicariously and made of the highest quality materials. AC Input: 100~240V / 50-60HZ. Safety Approved: OVP/OCP/OTP/SCP/CE Â. This adapter is not compatible with devices that requires power more than 90w. But lower watt power adapter is not compatible the higher one. See Picture on left. AC Input : 100~240V 50/60HZ. For Sony Compatible models. Pictures: Due to the difference between different monitors, the picture may not reflect the actual color of the item. Quality is the first with best service. Rate (item arrived). Type include:As the picture show. Fitted with energy saving technology. - No load Power Consumption Less Than 0.5W. Connector Size (mm). - 100% burn-in at full load, Hi-pot test for each unit. Output : 15/16/18/20/22/24V (90W Max). - Regulated Output and Low Ripple Noise. Output : 15/16/18/20/22/24V (90W Max). - Fitted with energy saving technology. - No load Power Consumption Less Than 0.5W. Connector Size (mm). - 100% burn-in at full load, Hi-pot test for each unit. - Regulated Output and Low Ripple Noise. 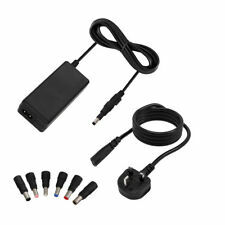 KENSINGTON LAPTOP MULTI CHARGER .